I love to pull down all of the boxes full of our Christmas decorations. But my very favorite boxes are the ones with all of the tree decorations. It's like a mini celebration all in its self. I have my special ornaments, like the one from our first year of marriage and our one year anniversary. The boys first Christmas. The count down ornament. The picture ornaments the boys have made me every year since pre-school. and of course the Rudolph's made from their foot and hand prints. 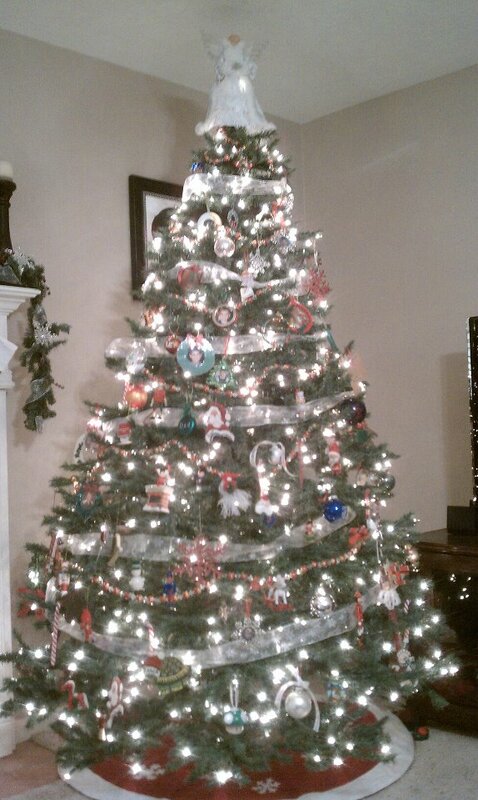 I used to love to decorate the tree. I always had to find the perfect spot for each ornament. A few years ago, I let the boys decorate the tree. I told them to have it and the only requirement was one ornament per branch. Normally my OCD would go straight into overdrive I spent the better part of that day in the back of the house waiting till they were done. And you know what, they did a fabulous job. As a matter of fact it was so good they get to decorate the tree every year now. I only put on four of my special ornaments and the angel on top. They did good - it looks beautiful! they do a great job! :) one less thing for you to do - if only we could learn to let go of more!! It looks great! I totally understand the OCD stuff, but I let it go a year or so ago! The kids enjoy it, and I can work on other stuff!